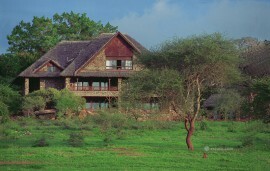 The Rhino Valley lodge is located on the southern bank of the Galana River in the Tsavo East National Park. 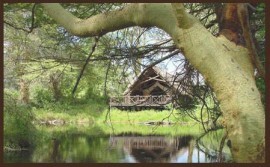 It is located 15 kilometers upstream from Lugards Falls in Tsavo East. 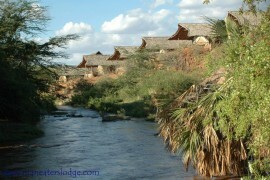 The lodge overlooks the Yatta plateau giving an excellent tourist attraction. 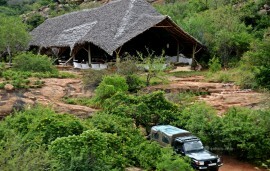 It is ideal for game drives and wild life game visits. Rhino Valley lodge has well-appointed spacious bungalows with en suite bathroom and private verandas from which you can watch elephants, buffalo, giraffe, etc come to drink at the water hole. .The roofing materials blend very well into the environment, so that the lodge seems to be a natural part of the landscape.They are all situated away from each other giving utmost privacy. They have a dining room and lounge for guests to enjoy their meals and drinks through out the day.